There are no words for how desperately excited I am about the upcoming release of the first movie in The Hobbit adaptation trilogy, The Hobbit: An Unexpected Journey. I was anxious for the release of the Harry Potter movies, but I was literally quivering in my theater seat while I waited for The Fellowship of the Ring to begin. Tolkien is a literary genius, and one of my heroes. The Hobbit is one of the most important books in my life, and I would like to share it with you. Live somewhere that can get shipments from Amazon, Fishpond, or the Book Depository for free. Be Awesome (and fill out the Rafflecopter). You're welcome to enter my OTHER GIVEAWAYS while you're here, but there aren't many at the moment. Thanks for stopping by and happy hopping! * This may not be the edition of the book that you receive - it is merely the image of the book I had saved to my blog. My daughter's favorite book. She can't wait for the movie. A great giveaway opportunity. Would love to win it and surprise her for her birthday. Thanks for this chance. The Hobbit is my favourite book as well. I'm not too excited at the prospect of Peter Jackson doing the movie. In my opinion he wrecked the LOTR story in his adaptation of Tolkien's vision. The movies were visually spectacular, but they were not Tolkien's story. I'm so excited about this movie! I read the book when I was younger but I'd love to read it again! Thanks for the giveaway! How do you feel about The Hobbit being made into three movies? 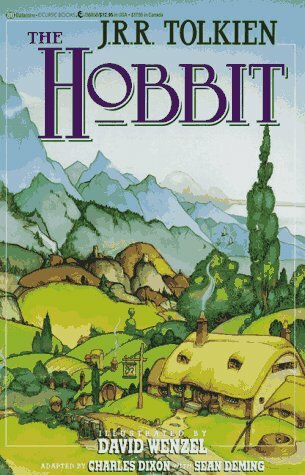 I am not entering (already own this book), but I just wanted to say that the Hobbit is also a very influential book in my life. I think that it is among the few books (along with the LOTR trilogy) that I have read at least ten times. I had my tickets for the midnight premier of Fellowship the moment they went on sale, and you can bet that I will be doing the same for The Hobbit!